The Adriatic Coast, Split and Dubrovnik, are easy to reach from the lodges. The distances to these two cities are approximately 180 kilometers. Moreover, the Montenegro border is 180 kilometers distanced from the lodges. 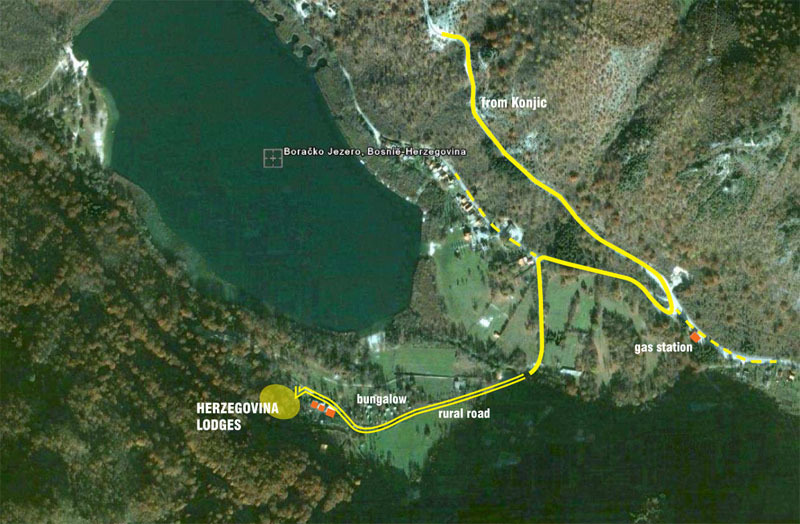 Herzegovina Lodges is the perfect and central location for your trip throughout the Balkan! By car: – Route from Sarajevo and Mostar to Herzegovina Lodges: You should drive to the small town called Konjic and that is from both places about 60 km. When arrived in Konjic the signs “Boracko jezero” (lake) should be followed. After 10 minutes you will enter a relatively narrow but paved road through the mountains. After a 17 km climb you will see a small gas station where you need to go right. After the first bend you need to turn left and 200 meters further the asphalt stops. You should go through a dirt road along small wooden houses (on the right) and after a few minutes you will see the lodges on your left hand side.